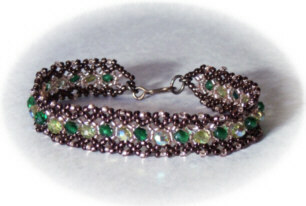 This is a fun bracelet to make. It uses both R.A.W. (Right Angle Weave) and netting. It's made in 3 stages, and you can stop after each stage and have a different look. We'll start by making the R.A.W. base. Pick up 6 Dark and 4 light seeds and tie them in a circle. 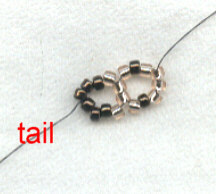 Leave a tail long enough to weave in later. 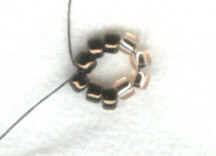 *Pick up 1L, 1D, 4L, 1D, 1L and making a circle, go up through the middle 2 side beads as shown in Pic 2. Needle around the circle until you're coming out of the 2 side beads on the new round you just added. See Pic 2a. Repeat from * until the bracelet is the length you want. 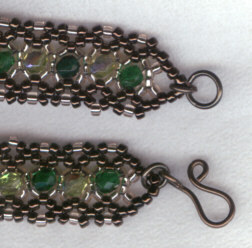 Remember to leave about an inch for the clasp when determining length. On the last round, pick up 1L, 6D, 1L. Needle all the way around the circle until you're coming out of the last Dark bead. Now we'll be adding our first round of netting by just going around the bracelet. Pick up 3D, and go into the D bead in the next round. 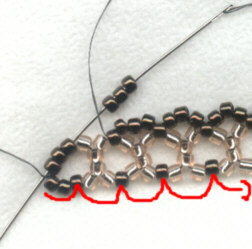 Continue adding beads like this all the way to the end. When you get to the end, pick up your 3 bead and go into the dark beads at the end. Needle all the way around the end until you're coming out of the last Dark bead. Now continue on with your netting to the other end. To add the center beads, needle around the end circle, and down through 3 of the Light beads, so you're coming out of your X in the center. 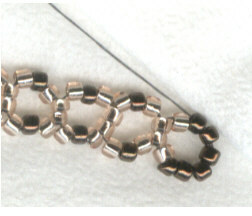 Pick up your 4mm bead, lay it across the center, and go down through the side beads in the next circle. Repeat to end. When you get to the end, needle down through one more Light bead, and through the first 2 Dark beads of the netting row. 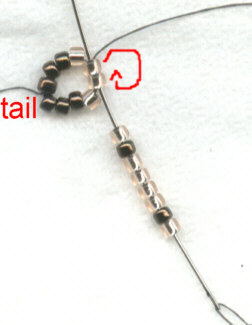 Pick up 1D, 1L, 1D and go into the center bead of the next set of three as shown in Pic 6. Continue all the way around as you did on the first netting row, needling through the dark beads on the end. 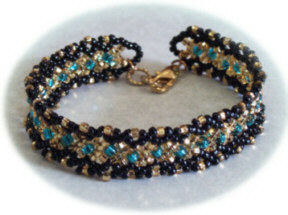 If you chose to do a beaded clasp, add it now. Click here for directions on making a beaded ball and loop. I chose to use a handmade hook with a ring, so I wove both ends of my thread in at this point, and then added the clasp in the end loops. Design Notes: You can see that this bracelet can be stopped after each round, giving you many design possibilities. Or you may choose to add even another row of netting! Here is a small sample made in one color, with just one row of netting and no center embellishment. 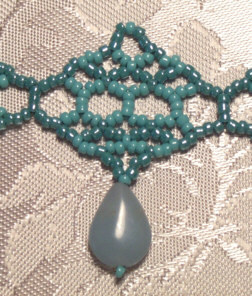 In this sample, I used 2 colors, one row of netting, and put a size 8.0 bead in the center. 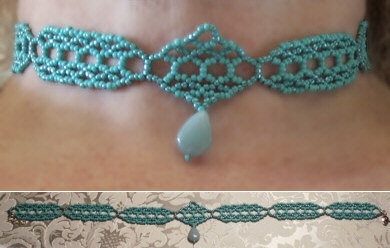 I made this choker using the same pattern, except that I increased the bead count in the R.A.W. base to 16 (5 on top and bottom, 3 on a side) and increased the netting to 5 beads instead of 3. I made small sections, finishing each section before moving on to the next. Although it was done continuously.... as opposed to making each segment separately and then connecting them after. Just play with the design, have fun with it, and see what you come up with! Marilyn Southmayd sent me this gorgeous set she created with this pattern. She said, "This Topaz and Silver Woven Set is made of Matsuno Slver Lined Silver AB seed beads and Light Topaz Swarovski crystals. I modified the pattern to create the rings and necklace."